In Industry 4.0, manufacturers can leverage digital tools, augmented realities, and expanded computer storage and analytics to transform business models and improve efficiency. Industry 4.0 has arrived and is changing the way people live and work. For manufacturing companies, this newest industrial revolution forces organizations to take a new approach to every facet of their businesses. This article takes a close look at the ways that digital tools and hypercomputing are primed to change the way manufacturers approach everything from R&D to customer service. It also looks at how these technologies can change entire business models, identify new markets, and alter the way work is done. The first industrial revolution arrived in the 1780s, with the advent of steam and water power to mechanize production facilities. The introduction of the assembly line and electrification allowed for the growth of mass production in the 1870s, marking the second revolution. It was in the 1960s, when the use of computing technologies and automation began to accelerate, that the third industrial revolution gained strength. The increasing use of cyber-physical systems that connect production systems with smart production systems. Reliance on the Internet of Things, the vast network of billions of connected objects that are equipped with sensors, storage, software, and wireless capacity to sense, record, and send information about usage, maintenance, and performance. Cloud computing that allows for the storage and reporting of massive data sets, which can be collected and used in real time. Supercomputing systems that provide the tools that can analyze those collected massive data sets. With supercomputing, manufacturers can collect, analyze, report on, and represent data in ways that can instantaneously leverage information. Smart technologies, including robotics, artificial intelligence, and 3D printing, all of which are creating new opportunities, more efficient manufacturing processes, and interconnectedness. Cybersecurity elements that require the careful protection of proprietary information, especially consumer, customer, and employee data. Industry 4.0 creates an experience where manufacturing systems and their output are connected to one another like never before. They can communicate, analyze, interpret, recommend, alert, and share information. By doing so, objects and machines share intelligence and drive enhancements. With the advent of Industry 4.0, manufacturers are forced to reexamine broad swaths of their enterprises. Here are a few ways that the manufacturing world is changing the lens it uses for perspectives on work and work products. The Segment of one. While manufacturing continues to be, in many cases, a volume industry, there is room for growth and niche production never before possible. The “segment of one” mindset reflects the growing expectations of customers, who increasingly insist on different relationships with the products and brands they use. Manufacturers need to understand where there are opportunities, and the technologies necessary, to create segments of one in their marketing, experiences, outputs, and customer service. Connected devices can be used to create unique products and services that are customized to smaller segments or even individuals. The Role of IoT. The Internet of Things provides the capability for manufacturers to use digital information in the physical realm. Manufacturing begins with information about a product, a market, a drawing, or an output from design software. This information is communicated to machines to make the design and transform it from conceptual to physical. With the IoT, sensors, networks, software applications, and other cognitive technologies provide invaluable inputs and outputs, allowing manufacturers to determine the scope, scale, and frequency of production. They allow manufacturers to better understand the risks related to security, reliability, and accuracy that can rapidly help improve processes and products. They can help address issues of latency and the timing of when manufacturing is optimal. It is here that IoT can make a deep change to manufacturing. Instead of linear conceptual-to-physical and physical-to-digital processes, IoT allows for continual loops. Ideas and information can now flow seamlessly and multi-directionally, creating a physical-to-digital-to-physical-to-digital loop of information, feedback, enhancement, and innovation that is rapid and highly impactful to consumers. Focus on outcomes. Customers today are no longer just interested in products. They are instead keenly interested in the outcomes afforded by those products. What does that mean for manufacturers? It could mean, for example, that manufacturers are selling not just the wearable devices that provide information on vital signs and fitness levels. Instead, it means providing customers with customized information about, say, ingredients in their food products that could result in a lowering of cholesterol or blood glucose levels. Big Data. Refers to the collection of data, both internally and externally, that can be used as an ongoing source of information for analysis and discovery. It is often generated by objects within the Internet of Things. Autonomous robotics. Factories of the near future will have the capability to use equipment and processes that improve via self-optimization, which will automatically adjust outputs, traffic, and processes in response to observed and reported data. Augmented reality. AR allows for manufacturers to access and manipulate information with virtual representations of real-world scenarios. These tools can be used to identify maintenance issues, test solutions, create applications, and solve customer issues. Point-of-use delivery. With connected objects playing a more important role than ever, it is possible to use POU delivery models to reduce wait times for customers, improve reliability, and anticipate production demand better than ever before. Additive manufacturing. The more formal name for 3D printing, additive manufacturing includes some technologies that have been around for years as well as newer tools. This realm of manufacturing output also includes rapid prototyping, direct digital manufacturing, and layered output. Advanced materials. Whether it is nanotechnologies, biomaterials, computing storage developments, or building materials, there is always a need to consider advanced materials in manufacturing. 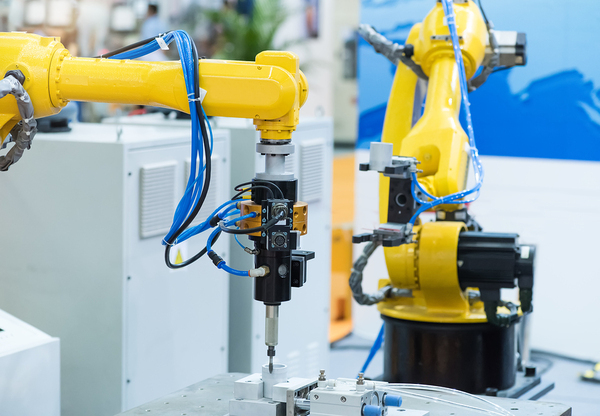 Intelligent robotics that can detect issues, report needed maintenance, and adjust manufacturing autonomously are key factors in the fourth industrial revolution. As Industry 4.0 becomes the norm, manufacturers should act today to determine the directions to take in adopting and adapting technologies that will impact business both in the short and long term. Here are a few of the main reasons why manufacturers need to tackle Industry 4.0 now. Operational Improvement. Deploying new technologies will provide a competitive advantage by maximizing the use of assets, minimizing downtime for equipment and workers, improving direct and indirect labor efficiency, and maximizing scheduling planning and accuracy. Partnership opportunities. With 4.0 technologies, companies can improve existing relationships by providing more supply chain transparency and identifying new partnerships that can lead to new markets or products. Better transparency leads to risk reduction through clearer availability of raw materials, ingredients, and products. Warranty and recall procedures can be smoother and aided by improved track-and-trace functionality, too. Supply planning. With deeper, integrated relationships with suppliers, manufacturers can create and respond to demand patterns and track the movement of goods throughout the supply chain. In turn, manufacturers can become proactive with customers, suggesting replenishment cycles and anticipating demand. Better transparency also gives manufacturers a deeper understanding of supplier capacity and lead times, leading to more informed supplier selection. Revenue potential. With Industry 4.0, companies can rapidly identify, pursue, develop, and deploy new products and services. Aftermarket opportunities can become significant, especially those that rely on the massive data sets being collected and analyzed. Stronger customer relationships. Customers are demanding different relationships with manufacturers and Industry 4.0 allows those companies to respond. Collected data and feedback can deepen customer relationships, create a better understanding of customer needs and wants, and unearth insights that heretofore were not feasible. Customers can be better integrated into the discovery, testing, feedback, and innovation processes. Market expansion. New products and services alone will generate new market possibilities. Industry 4.0 allows manufacturers to expand into emerging markets and international markets more quickly and to more readily gain insights into regional differences and preferences among customer bases. These new tools also offer a chance for companies to identify and pursue mergers and acquisitions more easily. Accelerated planning cycles. New tools allow for companies to identify potential new offerings, develop and test them, and bring them to market in weeks, not months or years. Automation and cloud computing provide the infrastructure to scale vertically or shift horizontally in support of newly emergent opportunities. In addition, companies can consider ways to make existing products smarter by equipping them with the tools that enhance the physical-digital-physical loop. Better labor usage. Good manufacturers understand the value of a well-informed, well-deployed labor force. With more information available, workers can make better decisions faster. They can be trained and deployed in smarter ways. Labor efficiency and productivity can be monitored, analyzed, and reported. Safety in the workplace can be monitored in real time, reducing accidents and lost work time. At NexTec, we help companies leverage the growing technological revolution with solutions that integrate disparate corporate systems. Enterprise resource planning (ERP) systems provide companies with the platforms that allow for smart manufacturing for the 21st century. We help companies identify their integration needs and identify, select, and install the right manufacturing ERP software systems that meet their unique needs. Our consultants have deep information and insights on the vendors, products, and features of leading ERP systems and will be trusted partners throughout the selection and installation processes. Download the NexTec Corporate Brochure to learn more about how NexTec can help your organization thrive in Industry 4.0.